From somewhere around the next corner, a cheerless serenade wafts down the alley, laments of past injustices, of loves lost and chances turned sour. The presentation is a throttled wail interrupted and refreshed every dozen bars by a quiet staccato of oppressed syllables that unleash the force that grows in suffering. The singing is sparsely accompanied on a warm guitar. Fado fills the night. I have just come down from the youthful hipness of Bairro Alto. 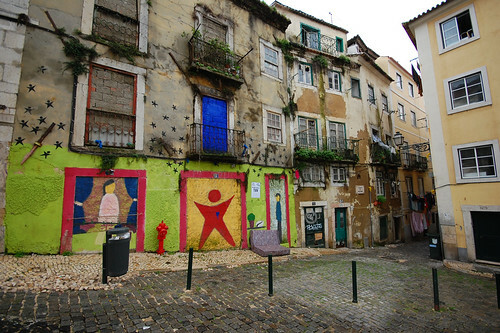 Lisbon's upper hood is the place to be on a Friday night, full of trendy bars and colorful drinks, but when I was strolling through the cobbled streets at nine, they were still nearly deserted and rather peaceful. The only signs of life came from dark characters that stepped from their hiding places at irregular intervals and pressed little sachets of brown herbs into my face, the dried content rustling as they extended their arms. "Hashish, hashish", they whispered with aggressive urgency. Whether they made any deals I didn't see, but I was sufficiently spooked that I didn't enter any of the countless venues of entertainment and diversion, for fear of getting trapped in an opium den or an illegal club with exorbitant door charges that are only revealed once the first innocuous beer has been consumed. Taking the Santa Justa elevator, a distinguished piece of antique furniture suspended inside a hundred-foot tall metal cage, down to Baixa, I was now decidedly hungry and on the look for a restaurant. I make my way to where I suppose the music, but it's hard to localize the source of it in the frequently cross-sected streets, even when the blare of traffic is far. Then, turning behind the majestic theater, I see the man that sings and plays. Emaciated and worn, he looks like someone who has known hard times, maybe slept rough. His appearance is grubby, his leather jacket broken and stained. Under his grimy hat, curly hair sprouts with impunity, the mixture of grey and white that can signify wisdom and sophistication. Here, it merely reflects the man's age. He sits on an upturned drawer, leaning against the wall of an old building of a shade of purple that was once popular for evening gowns. The building is covered generously in the veneer of decay, windows dull and shutters unhinged. In front of the man is a portable amplifier and on his knees his guitar. The case is open on the pavement in front of him. A few coins twinkle inside. The man's voice is mesmerizing, a baritone of liquid emotion, full of sorrow and pain. His entire body sings. The chest and shoulders rock involuntarily; the throat bulges and falls as he ululates. When the rush of quick syllables provides relief from the built-up of anguish, his lips move rapidly like a rapper's. He bends over the microphone and lets passion seep out, staring into the distance of his own tragic past, no eyes for his audience. The audience doesn't seem to have much of an ear for him either. In a dense throng, they crowd around a door exactly opposite from the musician's improvised stage. The door opens into a hole in the wall, revealing space for no more than two customers. Left and right, ceiling-high glass cases hold hundreds of bottles of red liquid. A slow-moving grandfather who looks as if he would prefer his retirement over manning the till in the middle of the night, sells ginja by the cup, at a euro a shot, to be consumed in the street. You buy, pay and exit, drink in hand. Ginjinha Sem Rival, the black-and-gold sign over the door proudly proclaims. Ginja, unrivaled or not, is the local brandy, made from and sometimes with cherries. It's pleasing to taste but apparently so toxic that even the most foolish kids don't dare to get wasted on it, never mind the cheapness of the ride. Some fancy places sell ginja in edible chocolate cups, potentially to soften the effect, but here the booze comes in flimsy plastic ones. This is a low-key operation and it shows in the clientèle. It is a crowd of mostly middle-aged locals, with some younger ones and the odd tourist thrown in for variety, standing in groups of two or three. Cautiously sipping their drinks they're chatting with friends or just enjoy the night. The music provides a background without which the atmosphere wouldn't be the same. I buy one shot and get two little cherries in it, the fruity avalanche inside in the bottle contained by crafty application of the stopper, and linger. The spot is precious, a bit of unspoiled authenticity in a city that had to make certain sacrifices in return for visitors' euros. The music blends with the brandy, the history of the buildings, and the mellow night to evoke nothing but Lisbon. It is also a brilliant example of economic symbiosis: the combination of music and drink must be the original recipe for merriment. After half an hour, I let the last drops of ginja scrape down my throat and start to walk, maybe stagger, down a street that almost immediately explodes in tacky tourist restaurants with garish lights and budget meals. Two blocks down, the lights are dimmer and the languages fewer. Pushing open a glass door that's obscured by menu options pasted against it from the inside on paper tablecloths, I step into a tiny patch of a restaurant, a mom-and-pop operation on minimal space. A row of tables lines the left wall, a bar and, behind a makeshift separation, the kitchen the other. Long fluorescent tubes shed a harsh light; the decoration is minimal. A calendar from the early sixties wouldn't be out of place. It doesn't look as if much has changed since then. Instead, there are three aquariums full of tropical fish happy they're not on the menu. The owner waits the tables and pours the drinks. I guess his wife is cooking, though I never see her. But when I order, the man sticks his head into the narrow door to the kitchen and shouts my choices. He then retraces his steps to the bar and pours another beer. While I eat, he goes to the entrance door repeatedly, opens it and sticks his head out for a while, possibly scouring the surroundings for potential customers. Bigger restaurants employ touts to drag tourists inside, ignoring the feeble protestations of people that should know better but won't resist because they're on a vacation and that's how things are. But my host always comes back alone. The meal finished and the bill settled, I step out into a night that is nearly half-over. In the narrow lane are a good dozen cars, one behind the other like pearls on a string, parked against the wall with meticulously care and apparently in complete disregard of the law. Earlier, my multitasking waiter would have told me had I asked, a police van had come by, almost unnoticed, its occupants proceeding to clamp the right front wheel of every single car in the street. When the drivers find out the next morning, exasperated cries of foul play will undoubtedly rip through the calm neighborhood. But right now, as I am making my way back to the hotel, the night is peacefully quiet. There is only the faint echo of fado leaking sadly from the other end of the street.